It's getting close to Halloween! You know what that means! I get all of the Reese's Pumpkins! *evil laugh* Don't worry. I'm not stingy. I'll leave all of the dum-dum suckers. 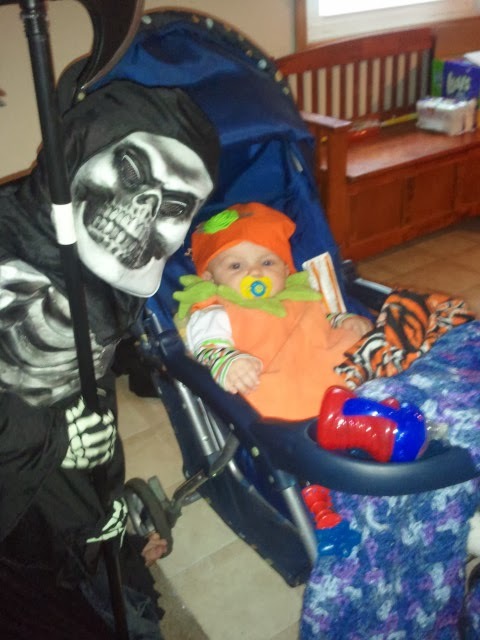 For Halloween last year, a friend of mine let me borrow her daughter's pumpkin outfit for my 8-month-old (at the time) baby girl. She had misplaced the hat, so I had to figure something out to complete the costume. I figured I would just buy a hat that looked similar, but I couldn't find one anywhere. After checking out a few more Halloween stores, I ended up at Hobby Lobby. 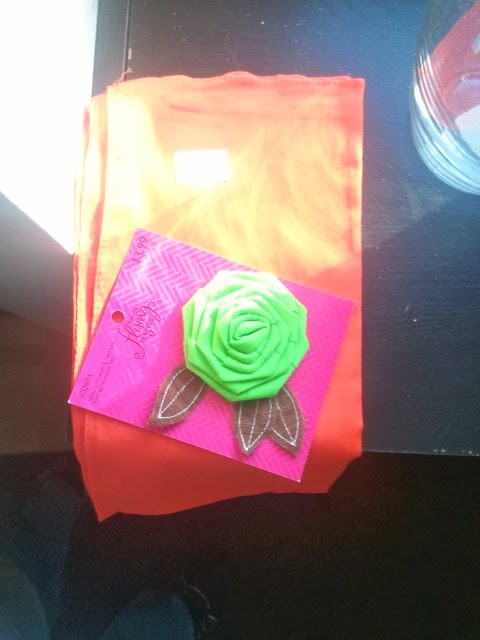 I didn't know what to get, so I just browsed the store for about 30 minutes and found an orange bandana and a green flower with green leaves. I'm not incredibly crafty, but I figured I could do something with it. Since I have yet to master the art of sewing, I simply busted out the glue gun. I put the bandana on her head and just kind of wrapped it around, pinned it in place, and then removed it and started gluing. Once it was all finished, I stuck the green flower on top and ta-da! So, clearly it doesn't match the outfit very well, but you couldn't really tell in the dark, and it did the job. My friend found the original pumpkin hat about a month later. Ha! Check out my other holiday tutorials for DIY Halloween effects!